Low-cost robotics, fully integrated in the corporate IT infrastructure, is a requirement in the era of modern industrial automation derived from the Industry 4.0 model. This paper presents a multidisciplinary robotics-based learning (R-BL) project consisting of the development of a modular control architecture and a gripper for small manipulators. The solution, as compared with options available in the current robotic market, is a balance between low-cost devices with industrial robot performance. The project is carried out as part of the Robotics and Mechanisms program, a course in the automation engineering degree program at the University of Brescia in Italy. 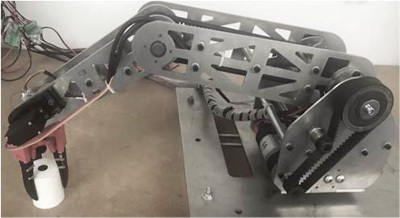 A 4-axis small-size robot, able to manipulate many kinds of objects, was designed and built by a student team by integrating the controller and the gripper. The controller was implemented using a real-time Raspberry platform by following a modular design concept. The control software is characterized by a short development time. The gripper was advanced to achieve low cost and modularity tradeoffs. M. Tiboni, F. Aggogeri, R. Bussola, A. Borboni, C. Perani, and N. Pellegrini, “Low-Cost Design Solutions for Educational Robots,” J. Robot. Mechatron., Vol.30, No.5, pp. 827-834, 2018. Z. M. Bi and W. J. Zhang, “Modularity Technology in Manufacturing: Taxonomy and Issues,” Int. J. Adv. Manuf. Technology, Vol.18, pp. 381-390, 2001. B. Gombert, G. Hirzinger, G. Plank, and M. Schedl, “Modular concepts for a new generation of light weight robots,” Industrial Electronics, Control & Instrumentation, Vol.3, pp. 1507-1514, 1994. R. Kolluru, K. P. Valavanis, N. Tsourveloudis, and S. Smith, “Design Fundamentals of a Reconfigurable Robotic Gripper System,” IEEE Trans. on System, Man and Cybernetics, Vol.30, No.2, Part A, pp. 181-187, 2000. S. Cinquemani, H. Giberti, and G. Legnani, “Kinematic Optimization of a 2DoF PRRRP Manipulator,” Advances in Italian Mechanism Science, Mechanisms and Machine Science, Vol.47, Springer, 2017. M. Serpelloni, M. Tiboni, M. Lancini, S. Pasinetti, A. Vertuan, and M. Gobbo, “Preliminary study of a robotic rehabilitation system driven by EMG for hand mirroring,” Proc. of IEEE Int. Symp. on Medical Measurements and Applications, MeMeA 2016, No.7533730, 2016. H. Giberti, E. Fiore, and A. Saccomani, “On the Mechatronic Design of a Low-Cost 6-DoFs Parallel Kinematic Manipulator,” Mechanisms and Machine Science, Vol.49, pp. 46-54, 2018. E. Uhlmann, F. Elbing, and J. Dittberner, “Innovative manufacturing technologies for the disassembly of consumer goods,” J. of Engineering Manufacture, Vol.218, No.9, pp. 1039-1046, 2004. M. Tiboni, G. Legnani, M. Lancini, M. Serpelloni, M. Gobbo, and D. Fausti, “ERRSE: Elbow robotic rehabilitation system with an EMG-based force control,” Mechanisms and Machine Science, Vol.49, pp. 892-900, 2018. S. Popic and B. Miloradović, “Light weight robot arms – an overview,” Proc. of Infoteh, pp. 818-822, 2015. J. Angeles, “Fundamentals of Robotic Mechanical Systems: Theory, Methods and Algorithms,” Springer-Verlag, 1997. O. Ibrahim and W. Khalil, “Kinematic and dynamic modeling of the 3-RPS parallel manipulator,” Proc. of the 12th IFToMM World Congress, 2007. Y. Qin, K. Zhang, J. Li, and J. S. Dai, “Modelling and analysis of a rigid-compliant parallel mechanism,” Robot. Comput.-Integr. Manuf., Vol.29, pp. 33-40, 2013. F. Aggogeri, N. Pellegrini, and R. Adamini, “Functional Design in Rehabilitation: Modular Mechanisms for Ankle Complex,” Applied Bionics and Biomechanics, Vol.2016, Art. 9707801, 2016. E. Fiore, H. Giberti, and G. Bonomi, “An innovative method for sizing actuating systems of manipulators with generic tasks,” Mechanisms and Machine Science, Vol.47, pp. 297-305, 2017. S. Jung, “Experiences in developing an experimental robotics course program for undergraduate education,” IEEE Trans. Educ., Vol.56, No.1, pp. 129-136, 2013. C.-S. Lee, J.-H. Su, K.-E. Lin, J.-H. Chang, and G.-H. Lin, “A project-based laboratory for learning embedded system design with industry support,” IEEE Trans. Educ., Vol.53, No.2, pp. 173-181, 2010. S. E. Kerns, R. K. Miller, D. V. Kerns, and National Academy of Sciences, “Designing from a blank slate: The development of the initial olin college curriculum,” Educating the Engineer of 2020: Adapting Engineering Education to the New Century, Nat. Acad. Press, pp. 105-113, 2005. N. K. Uttarkar and R. R. Kanchi, “Design and development of a lowcost embedded system laboratory using TI MSP430F149,” Proc. Int. Conf. Commun. Signal Process. (ICCSP), pp. 165-175, 2013. S. Ahmad, “A laboratory experiment to teach some concepts on sensor-based robot assembly systems,” IEEE Trans. Educ., Vol.31, No.2, pp. 74-84, 1988. R. H. Chu, D. D. C. Lu, and S. Sathiakumar, “Project-based lab teaching for power electronics and drives,” IEEE Trans. Educ., Vol.51, No.1, pp. 108-113, 2008. W. Durfee, P. Li, and D. Waletzko, “Take-home lab kits for system dynamics and controls courses,” Proc. Amer. Control Conf., Vol.2, pp. 1319-1322, 2004. M. Gunasekaran and R. Potluri, “Low-cost undergraduate control systems experiments using microcontroller-based control of a DC motor,” IEEE Trans. Educ., Vol.55, No.4, pp. 508-516, 2012. J. Rodriguez-Resendiz, G. Herrera-Ruiz, and E. A. Rivas-Araiza, “Adjustable speed drive project for teaching a servo systems course laboratory,” IEEE Trans. Educ., Vol.54, No.4, pp. 657-666, 2011. M. Hedley and S. Barrie, “An undergraduate microcontroller systems laboratory,” IEEE Trans. Educ., Vol.41, No.4, p. 345, 1998. A. Kommu, R. R. Kanchi, and R. P. G. Varadarajula, “Design and development of a low-cost student experiments for teaching ARM based embedded system laboratory,” Proc. IEEE Int. Conf. Teach. Assessment Learn. Eng. (TALE), pp. 515-520, 2013. C. Parikh, “Autonomous robot: An intellectual way of infusing microcontroller fundamentals into sophomore students,” Proc. IEEE Frontiers Educ. Conf., pp. 1-4, 2015. J. Solis, R. Nakadate, T. Yamamoto, and A. Takanishi, “Introduction of mechatronics to undergraduate students based on robotic platforms for education purposes,” Proc. 18th IEEE Int. Symp. Robot Human Interact. Commun., pp. 693-698, 2009. R. Grover, S. Krishnan, T. Shoup, and M. Khanbaghi, “A competition-based approach for undergraduate mechatronics education using the arduino platform,” Proc. 4th Interdiscipl. Eng. Design Educ. Conf., pp. 78-83, 2014. J. Froyd and National Academy of Sciences, “The engineering education coalitions program,” Educating the Engineer of 2020: Adapting Engineering Education to the New Century, Nat. Acad. Press, pp. 81-93, 2005. B. T. Chowdhury, S. M. Kusano, A. Johri, and A. Sharma, “Student experiences in an interdisciplinary studio-based design course: The role of peer scaffolding,” Proc. 121st ASEE Annu. Conf. Expo., pp. 1-13, 2014. K. Jablokow, J. V. Matson, and D. Velegol, “A multidisciplinary MOOC on creativity, innovation, and change: Encouraging experimentation and experiential learning on a grand scale,” Proc. 121st ASEE Annu. Conf. Expo., pp. 1-23, 2014. J. A. Piepmeier, B. E. Bishop, and K. A. Knowles, “Modern robotics engineering instruction,” IEEE Robot. Autom. Mag., Vol.10, No.2, p. 3337, 2003. K. Nagai, “Learning while doing: Practical robotics education,” IEEE Robot. Autom. Mag., Vol.8, No.2, p. 3943, 2001. E. Krotkov, “Robotics laboratory exercises,” IEEE Trans. Educ., Vol.39, No.1, p. 9497, 1996. M. F. Robinette and R. Manseur, “ROBOT-DRAW, an internet-based visualization tool for robotics education,” IEEE Trans. Educ., Vol.44, No.1, p. 2934, 2001. M. Hernando, R. Galan, I. Navarro, and D. Rodriguez-Losada, “Ten years of Cybertech: The educational benefits of bullfighting robotics,” IEEE Trans. Educ., Vol.54, No.4, pp. 569-575, 2011. H. Hassan, J. M. Martinez, C. Dominguez, A. Perles, and J. Albaladejo, “Innovative methodology to improve the quality of electronic engineering formation through teaching industrial computer engineering,” IEEE Trans. Educ., Vol.47, No.4, pp. 446-452, 2004. G. Solomon, “Project-based learning: A primer,” Technol. Learning, Vol.23, pp. 20-30, 2003. M. Somerville et al., “The Olin curriculum: Thinking toward the future,” IEEE Trans. Educ., Vol.48, No.1, pp. 198-205, 2005. R. Murphy, “’Competing’ for a robotics education,” IEEE Robot. Autom. Mag., Vol.8, No.2, pp. 44-55, 2001. C. Kitts, “Surf, turf, and above the Earth,” IEEE Robot. Autom. Mag., Vol.10, No.3, pp. 30-36, 2003. J. R. Savery and T. M. Duffy, “Problem based learning: An instructional model and its constructivist framework,” Educ. Technol., Vol.35, No.5, pp. 31-38, 1996. J. Solis and A. Takanishi, “Practical issues on robotic education and challenges towards roboethics education,” Proc. 18th IEEE Int. Symp. Robot Human Interactive Commun., pp. 561-565, 2009. J. Macias-Guarasa, J. M. Montero, R. San-Segundo, A. Araujo, and O. Nieto, “A project-based learning approach to design electronic systems curricula,” IEEE Trans. Educ., Vol.49, No.3, pp. 389-397, 2006. W. Daems et al., “PeopleMover: An example of interdisciplinary project-based education in electrical engineering,” IEEE Trans. Educ., Vol.46, No.1, pp. 157-167, 2003. M. Ceccarelli, “Robotic teachers assistants,” IEEE Robot. Autom. Mag., Vol.10, No.3, p. 3745, 2003. A. Leopoldo, “Low-cost Printable Robots in Education, Fuentes-Dur Pedro, Perry David,” J. of Intelligent and Robotic Systems, Vol.81, p. 1, 2016. Z. Lu, A. Chauhan, F. Silva, and L. S. Lopes, “A brief survey of commercial robotic arms for research on manipulation,” Proc. IEEE Symp. Robot. Appl., pp. 986-991, 2012. I. Ebert-Uphoff, “Introducing parallel manipulators through laboratory experiments,” IEEE Robotics & Automation Magazine, Vol.10, No.3, p. 9, 2003. K. Takahashi, M. D. Best, N. Huh, K. A. Brown, A. A. Tobaa, and N. G. Hatsopoulos, “Encoding of Both Reaching and Grasping Kinematics in Dorsal and Ventral Premotor Cortices,” J. Neurosci., Vol.37, No.7, pp. 1733-1746, 2017. L. Zhou, S. Bai, and M. R. Hansen, “Integrated dimensional and drive-train design optimization of a light-weight anthropomorphic arm,” Robotics and Autonomous Systems, Vol.60, Issue 1, pp. 113-122, 2012. C. A. Perani, “POWER-KI Preludio: a programming language,” XPLAB Research in Automation, 2012. R. R. Ma, L. U. Odhner, and A. M. Dollar, “A modular, open-source 3d printed under actuated hand,” 2013 IEEE Int. Conf. on Robotics and Automation (ICRA), 2013. A. Dollar and R. Howe, “A robust compliant grasper via shape deposition manufacturing,” IEEE/ASME Trans. on Mechatronics, Vol.11, No.2, pp. 154-161, 2006. N. Pellegrini, “A thermo-dynamical constitutive model based on kinetic approach for shape memory materials,” Advances Materials Research, Vol.651, pp. 42-48, 2013. A. Gegeckaite, H. N. Hansen, L. De Chiffre, and P. Pocius, “Handling of Micro Objects: Investigation of Mechanical Gripper Functional Surfaces,” Proc. of 7th EUSPEN Int. Conf., pp. 185-188, 2007. S. Ruggeri, G. Fontana, G. Legnani, and I. Fassi, “Design Strategies for Vacuum Micro-Grippers With Integrated Release System,” 11th Int. Conf. on Micro- and Nanosystems, 2017. G. J. Monkman, S. Hesse, R. Steinmann, and H. Schunk, “Robot Grippers,” WILEY-VCH Verlag GmbH & Co. KGaA, 2007. G. Fantoni, J. Tilli, and S. Capiferri, “Method for supporting the selection of robot grippers,” The CIRP 24th Design Conf., 2014. L. Natale, F. Orabona, G. Metta, and G. Sandini, “Exploring the world through grasping: a developmental approach,” Proc. 2005 IEEE Int. Symp. on Computational Intelligence in Robotics and Automation, pp. 559-565, 2005. A. Bicchi and V. Kumar, “Robotic grasping and contact: a review,” Proc. 2000 ICRA. Millennium Conf. IEEE Int. Conf. on Robotics and Automation, Vol.1, pp. 348-353, 2000. K. Hsiao, P. Nangeroni, M. Huber, A. Saxena, and A. Y. Ng, “Reactive grasping using optical proximity sensors,” Proc. 2009 ICRA. IEEE Int. Conf. on Robotics and Automation, pp. 2098-2105, 2009. G. Bone, A. Lambert, and M. Edwards, “Automated modeling and robotic grasping of unknown three-dimensional objects,” 2008 IEEE Int. Conf. on Robotics and Automation, pp. 292-298, 2008.